Executive producer Andrew Kreisberg now insists the rumors about the working title will not reflect the title when the spinoff goes to series. We'll keep you posted when the CW finally makes a decision about the project. The Arrow/The Flash spinoff has been drawing a lot of attention for its casting announcements recently. From super villains like Captain Cold and Heat Wave to brand new heroes like Hawkgirl and Rip Hunter, this spinoff is mixing together a variety of DC heroes and villains. Now, after weeks of not having anything to name this particular project, we have finally have a possible title for it, but what’s odd is that it’s named after just one of the main characters: The Atom. 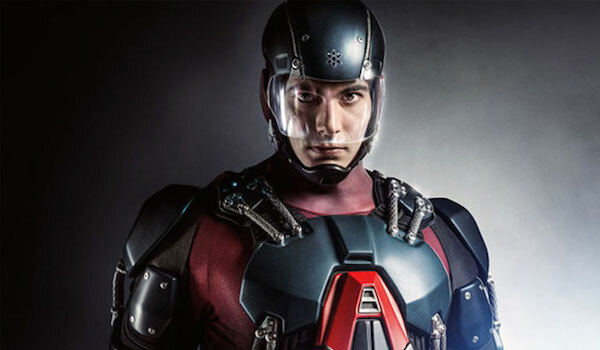 Ray Palmer, played by Brandon Routh, was introduced this season on Arrow as a billionaire inventor who bought Queen Consolidated and renamed it Palmer Technologies. After hiring IT extraordinaire Felicity Smoak for the company, he drafted her into his secret A.T.O.M. (Advanced Technology Operating Mechanism) project. After watching his fiancée be killed during Slade Wilson’s attack on Starling City in Season 2, Ray decided that he wanted to use technology to fight crime, and with Felicity’s help, he could get his exosuit functional. In Season 3's Episode 15, Ray finally got it to work, and after a test flight around the city, we finally saw it in action when he took on Oliver as The Arrow in Episode 17. After resolving their differences, Ray and Oliver will be working together in Episode 19 to take down the metahuman Deathbolt. Given that Ray has been a major recurring character during Arrow Season 3, it makes sense that they would choose to highlight him, since aside from Caity Lotz (whose character hasn’t been identified yet), he’s arguably the most recognizable of the bunch. That being said, it seems weird that when a project is starring so many DC heroes and villains, only one of them is highlighted. Much like how movies have temporary titles before going with the real deal, there’s a good chance that The Atom is just a placeholder until the executive producers can come up with something better when production is further along. On the other hand, perhaps Atom truly is the lead and the others are just supporting characters. If he’s the leader of the “team,” he may be getting the most attention, and the spinoff won't be so much an ensemble as it is more like its parent shows Arrow and The Flash. One thing is for sure, though: we can expect to see a lot of the Atom within the next year should this spinoff get off the ground. Hopefully by then he’ll have actually shrunk himself. At some point, he needs to move away from being the DC Iron Man and start using his superpower from the comics.